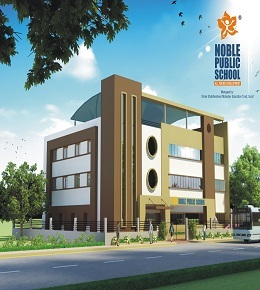 Founded in 2010,Noble Public School is fast growing Co-educational, English Medium & Gujarati Medium School in Surat with 1600 Students. The campus of NPS is spread across an area of 1000 Sq Mtrs. Located in one of the fastest growing cities of India, NPS aspires to be a school with global sensibility. NPS is founded on the ethos of education as the means by which we explore the world and contribute to transforming the society. Vision (Why & How) : Make remarkable difference in the lives of our students and bring about positive change in the society by providing well-balanced education &comprehensive learning experience. 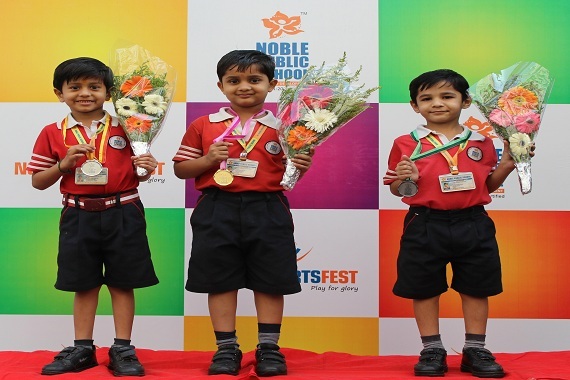 What makes NPS Surat truly dynamic school? ¬ Learning environment at NPS empowers the students to be constructive thinkers, fuels students’ imagination & nurture their curiosity through effective learning tools with the support of advanced Information & Communication tools for learning. ¬ Instill a sense of belongingness amongst the alumni students so that they cherish to have been a part of NPS. ¬ The radiance of NPS’ powerful learning is reflected in the teaching style of its strong team of teachers.Teachers of NPS show them the path to lifelong learning and inspire them to be enlightened citizens of tomorrow. ¬ NPS focuses on infusing self- confidence in each student along with encouraging them to develop dynamic team spirit. ¬ NPS emphsizes on generating righteous & happy youth, who are professionally sound and morally upright. Thereby preparing today’s youth to be an asset to the nation. Merely imaprting knowledge is not our aim, we also emphsize on developing life skills. ¬ Effective learning tools used with the support of advanced information & communication tools of learning, as we embrace innovation in academics as well as in our skll development activities. ¬ Students are given liberty and opportunty to unfold their creativity at NPS, as it is a liberated, co-educational school with excellent academic standrads, having an array of extra-curricular activites. ¬ State of the art facilities & modern amenities matching with the global teahcing standrads.